There’s no easy way to become a leader. Nor in small or big communities, countries, or companies. Leading the way to new trends, when technological progress goes faster than the light – but at the same time is implemented and absorbed at different speeds, has never been harder than before. We are alone but connected, competitors but allies. We are separated by thousands of kilometers, but we’ve never been so close to each other, so intimately connected, or rather, inter-connected. In Suzhou, China, Advantech has attracted more than 6 thousand clients and worldwide partners who gathered to attend the first IoT Co-Creation Summit, that took place the 1st and 2nd of November. During the summit, Advantech presented its newest IoT platform structure WISE-PaaS 3.0 and 32 IoT Solution Ready Packages (SRPs) co-created with software and industry partners. 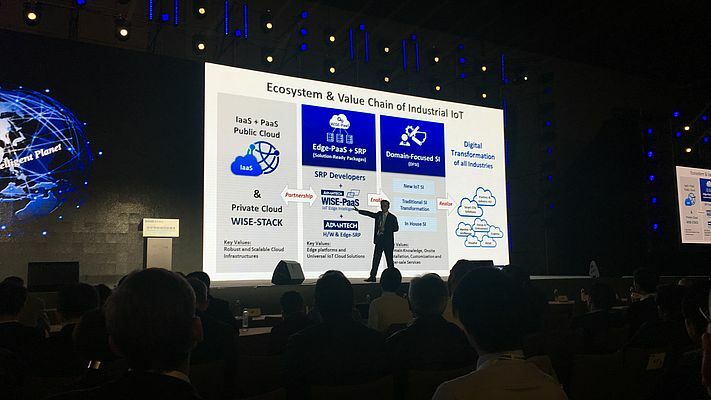 The event aimed to support software/hardware integration for various industries, connect and build a complete industrial IoT ecosystem and value chain, and officially announces Advantech’s step into the next IoT stage. The Taiwanese company, strong of its 35-year history as a major provider of industrial computer and data acquisition systems, with the rare ability and long experience in bringing IT and OT together, is now consolidating its position as a solution provider in the domain of IoT. ‘’Data acquisition is today what we see as OT – Operational Technology, while IPC translates today into IT – Information Technology. If we bring these two technologies together, IT and OT, we obtain IoT. We have a heritage of 35 years of advantage from both worlds, and this is our biggest differentiation compared to companies who are only IT or OT. Advantech found a spot-on position thanks to its historical technology roadmap, and that created for us an enormous advantage’’ explained to me Jash Bansidhar, Head of Industrial IoT Europe at Advantech, during our meeting in Suzhou, on the occasion of the Co-Creation Summit. What’s even most interesting, is that ten years ago Advantech made a shift on its business towards IoT, changing its mission statement to “Enabling an Intelligent Planet”, which was also the leading theme of the Co-Creation Summit. “At that time, we didn’t know that the world would have been completely transformed by IoT. But our CEO, K.C. Liu, had the right vision: Our mission shifted to help system integrators enable an intelligent planet. And now you see that IoT is enabling smart cities, smart manufacturing, and smart roads… an actual smart planet’’ continued Mr. Bansidhar. A smart intuition was that of K.C. Liu, President and CEO of Advantech, who founded the company in 1983 and has led it to be recognized as one of the Top 20 Taiwan Global Brands. ‘’In view of the IoT application characteristics diversity, extensivity, and fragmented market, Advantech has assisted industries in integrating and connecting existing hardware and software, and regards creating a complete industry value chain as its primary task in IoT industry development’’ stated Mr. Liu. In line with this trend, Advantech launched the WISE-PaaS platform in 2014, and over two years later connected the platform thoroughly from top to bottom, including services such as sensors, edge computing, communications, PaaS platform, SRPs, and cloud service operation, and creating a complete IoT supply chain. The platform is, therefore, more sophisticated and has increased its value. This reinforces Advantech’s position in the overall IoT ecosystem—its edge platforms and Universal IoT Cloud Solutions. ‘’With the WISE-Paas, we are able to connect everything and send the data collected by the sensors to the cloud. That’s why this intelligent platform has started to become so popular especially in Southern Asia, since it supports people who don’t have enough tools to understand IoT technology. The idea is that you don’t need to start from scratch: We give you the platform and you can start from 30 or 40 percent’’ declared Jonney Chang, Associate Vice President of the Industrial IoT Group at Advantech. For Advantech, in order to lead the IoT advancement in the next years, not only technology is needed but also a linear organization. That’s why the company has lined up 3 phases of evolution that characterize the AIoT Long Term Co-Creation Business Model: Phase I focuses on Automation and Embedded Platforms, Phase II is the launch of Solution Ready Packages (SRPs) – integrating IoT software and hardware solution platforms thanks to WISE-Paas IoT Edge Intelligence – and Phase III features an Edge-to-Cloud integrated application. ‘’Advantech innovated its products with the highest technology to fulfill selected focused markets: This was what we called the ‘Phase I’ of our business model. ‘Phase II’ consists of moving our hardware products into the software called the Edge Intelligence, which enables the hardware to be connected easier to the machine. The problem has always been that the IT world couldn’t communicate with the OT world: That’s why we have to help them speak the same language and interact to enable IoT’’ said Mr. Chang. 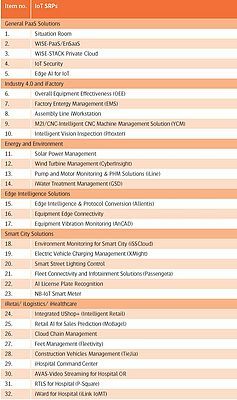 To accelerate the integration of software and hardware in each industry, Advantech has prepared 32 IoT SRPs, with the collaboration of more than 50 partners, which were officially introduced at the IoT Co-Creation Summit. The SRP co-creation model is based on WISE-Paas 3.0 and was developed to provide solutions to different demands: General Paas Solutions, Industry 4.0 and iFactory, Energy and Environment, Edge Intelligent Solutions, Smart City Solutions, and iRetail/iLogistics and iHealthcare. ‘’With the SRPs, we want to create a standard for new technologies. We called them ‘Solution Ready Packages but the idea is not that we are ‘ready for the solution’, since our partners who buy it need to put something of their technology and application to complete the solution. Rather, SRPs aim to become the general standard that consents to accelerate the IoT transition, moving from the software to the hardware’’ explained Mr. Chang. The concept is quite clear: ‘’Go Together, We Go Far… Co-Creating the Future of the IoT World’’ is Advantech’s vision and main definition of their long-term business model.